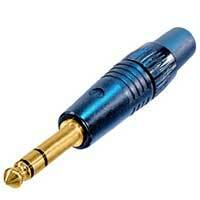 NEUNP3CB - NEUTRIK NP3C-B 1/4" Stereo (TRS) Plug. Gold Plug, Black Barrel. The lifetime plug, Diecast shell, Neutrik unique chuck-type strain relief with PU-sleeve for optimal cable protection.